Susan Griggs started Mystic Mermaid Estate Services in 2010 as a spin off from her store, Mystic Mermaid, which was located at the Palace Shops in Ghent. 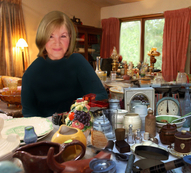 The store closed down in 2013 which allows Susan to dedicate all of her time to estate sales. Previously, Susan worked 10 years in advertising as a Creative Director at the Virginian Pilot designing ads, posters, banners, web sites, signs and much more for customers wanting to get their names out to the public. Prior to that, she was a marketing director for a real estate firm. There she helped stage homes and created brochures, ads, signs and displays to help sell older homes and new homes. She worked with builders and developers helping them make their homes sell as quickly as possible. Susan knows how to market and advertise your home to reach the maximum amount of people in the area and she'll help make your sale a huge success! There are so many people out there that want to downsize or empty a parents house but don't know where to begin. And the stress can be overwhelming. That's why we're here. Once we're hired to take care of yours or a loved one's home, you don't even have to be there at all. Just call us and we'll take care of all of your your moving needs.